I’ve got another 200K permanent route in the works: Gravity Hill 200K. So named because the route goes right by (and optionally on as a side detour) Gravity Hill. There are a couple other points of interest too: Blue Knob, and the Flight 93 Memorial. The former is very much on the route (you climb up to the summit, where the ski area is located, and then you descend down through the State Park), but the latter is about a 5 mile out-and-back side trip. 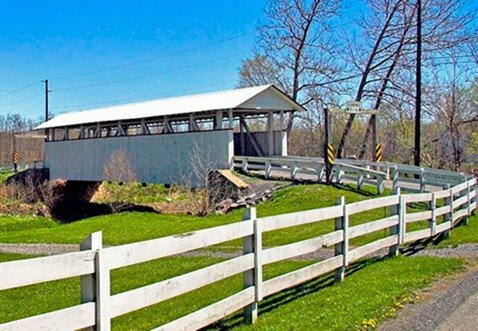 There are even a few covered bridges along the route (well about 300 feet off the route). One is in New Baltimore, and another in New Paris, and other in Ryot (which was burned down, but was was rebuilt). Then there is the Dr. Knisley bridge, and the Snooks Bridge, which you will need to travel over. Visible in this linked photo of the N. Baltimore bridge is the “Church of the Turnpike“. 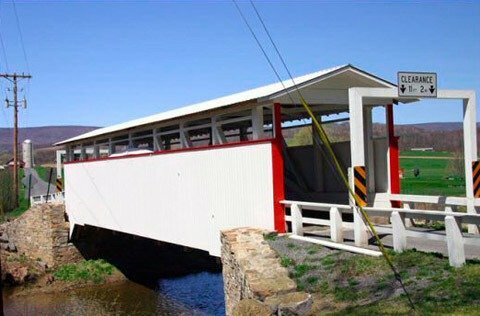 Bedford county is rife with covered bridges, reportedly 14 of them. I’ll be scouting this sometime in the next month by car, and by bike by the end of spring.